KaTropa a new promo extension has been implemented by Talk N Text, the promo is called "Extra Promo". Basically, you'll register to a specific promo and follow by subscribing to Extra Promo. 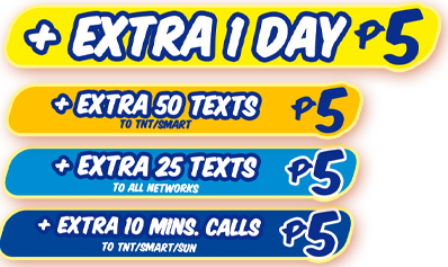 This will extend your current promo or avail various extras like extra 50 text to SMART/TNT, extra 25 text to all networks or extra 10 minutes call to SMART/TNT all for P5.00 only. If you don't know how to register on the promo above, you can always use our search bar on the right for more information on how to register and other useful info. Now, that you are already subscribed to any promo above lets proceed on how to register to TNT Extra Promo. To register: Text EXTRA and send to 4545, wait for the confirmation message and enjoy your extra 1 day text, call, and text to all networks. 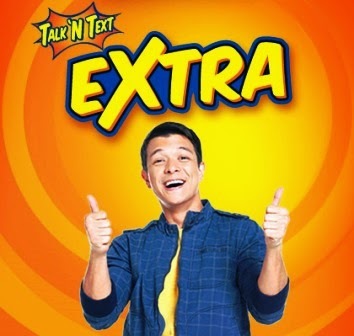 So, enjoy mga KaTropa on this new promo of Talk N Text, they are really giving Filipinos the cheapest way to get in-touch with our love ones. Note: Available only for Talk N Text subscribers. error pa yata to. .1day ba talaga o 12 hrs. .bat na ubos agad load ko kina umagahan e dapat 6 pm pa eh. .
until how many times can I use extra per promo subscription? nag reg naku tagal comfirmation ... 5pesos totoo nga di naman cgurado yung load kung hanggang saan diba nakakairita lang diba...!!!! wala bang para sa utalk20 . ?